Notes: 7 minute cap. If the work is completed in less than 7 minutes, rest the remainder of the 7 minutes. Notes: Advanced athletes may perform a split/push Jerk for the push press portion. 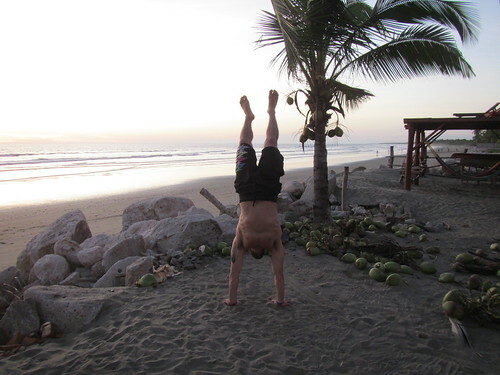 I intend to get a handstand on the beach picture before I leave South Africa…. This is my goal! But I also didn’t intend on getting a flat tire today, having my printer run out of ink as I was about to print my boarding pass, have my ride find out she cannot get to her car, realize that my passport at hand is my old, expired passport and a couple other hiccups only a few hours from my flight. Luckily I am at the airport and more than ready to go home to south Africa and get away, see family and all those nostalgic places I have not seen in 6 years. So i will not be discussing every rep counts just yet, but rather just be satisfied that the airports have free wireless so I can get your workout up. I am thankful for all my PCF friends and family who helped me out today and will be taking care of Spiff and my responsibilities while I am gone, making it possible for me to take this trip.